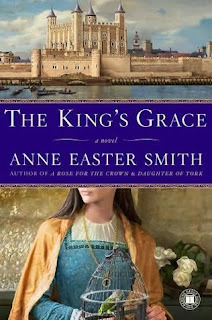 Passages to the Past: The King's Grace Giveaway!! Count me in please - thanks. This book sounds great! I'd love to be entered. Thanks very much. This one looks good so I am in. This book sounds cool. I haven't read much about the Plantagenets. Please enter me. I am a follower and have posted on my sidebar http://themaidenscourt.blogspot.com/. Please enter me in this give away, thanks. I am a follower and I also posted it on my facebook: http://www.facebook.com/ext/share.php?sid=106097905804&h=HhYD-&u=PgKrz&ref=nf . I don't know if you can see it though because we aren't friends on facebook... but I tried anyway. Please don't leave me out! I'm a follower already too! I'm a follower. Count me in. Hi Amy:) I'd love this one, and I will also twitter! Please enter me...I'm a follower. oooo.. Please enter me... I follow (stalk)... thank you. Count me in - this is on my TBR list. Add my name to the drawing, please! I already follow your blog via GoogleReader. Oh! I would love to read this! Thank you for the chance to win it! Please enter me! I'm a follower (just can't seem to stay away!). Of course I have to enter. I can't resist your giveaways. I already follow and I'll post on my sidebar. Would love a chance to read this one. I am a follower. Sounds like there is a lot of potential for scandal and intrigue. Please enter me! Thank YOU! You are very Generous! I have blogged about this one on my sidebar ``` enter me too! i m already a follower! I would really like to enter. I'd love to read this please count me in too! I also already am a follower so please add all my entries. Thank You! I have wanted a copy of this since I checked it out of the library!! Sign me up!! I am already a follower and have you listed on my blog as well! please add me, this seems to have all the components i like! I love historical romance and I've not read any by this author. I would love to check her books out and review them. Sounds like a great book! Please include me in the giveaway. I follow your blog. I would love to be included in this drawing. Thank-you for hosting this. I love historical fiction. I tried to become a follower but was sent to facebook, which I didn't want to do. So I'm not a follower. I love historical novels. Please enter me in your draw. Thanks. Please count me in ! I'd love to read this. I am a follower of your wonderful blog, and would love to win this book. Have read "Daughter of York" and found it an interesting tale. Would love to read this book, please put me in the drawing. The book is linked to in my sidebar and I am a follower. I am a Follower and I am also an international entry. i'd love to be included - thank you! Please enter me in the drawing. I am a follower. I'm already a follower and I have this giveaway listed on the sidebar of my blog at histficchick.blogspot.com. pls include me in this giveaway! Let's hope post 100 means luck! What a great blog - offering so many wonderful historical novels for giveaways. I enjoy reading your reviews and have my fingers crossed hoping to win one of these books. Please include me in this give away. I would love a chance to win, I'm a follower already and posted about the giveaway on my sidebar here.. This looks really good! I'm already a follower! Please count me in...sounds like a great book. thanks. I would like to try my chances. sounds interesting,need for vaca,thx for contest..
Hi - I follow you via Facebook and Bloglines, and I would love a chance to win this book - thank you!